Osseous surgery is performed when a pocket around a tooth has not responded to other treatments. Pockets form when gum disease is left untreated and grow deeper as the bacteria eat away at gum and bone. Osseous surgery is a treatment that creates a clean environment around the tooth so that the tooth can be retained rather than lost. Don't be embarrassed by your ill-fitting dentures or missing teeth anymore! Dental implants can restore the beauty and function of your smile! 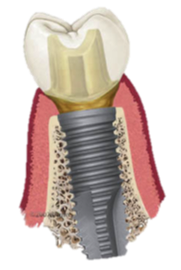 Dental implants are designed to look, feel, and function like your natural teeth. Thank you for visiting our practice! We hope that the information is educational and helpful, and will serve you to better understand periodontal disease, prevention and treatment options. We also hope that the information will enable you to pro-actively participate in the treatment and prevention of periodontal disease and enable you to enjoy good oral health. The goal of our practice is to provide the best possible periodontal treatment solutions: Up-to-date knowledge, the most modern equipment, experienced, well-trained and caring staff, and unrivaled professionalism. Our participation in continuing education programs keeps us at the forefront of periodontics—our patients benefit. We are dedicated to teach our patients effective home care maintenance techniques that will ensure good oral hygiene, which will enhance optimal oral health and prevent periodontal disease. We encourage your active participation in your oral health and invite your dialog with us. E-mail your questions about any aspect of implantology, periodontics and aesthetic reconstruction, or any other periodontal concern you may have. Periodontal disease is the major cause of about 70 percent of adult tooth loss. It affects three out of four persons at some point in life. The main cause of gum disease is bacterial plaque, a sticky, colorless film that constantly forms on your teeth. If the plaque is not removed, it hardens into a rough, porous deposit called calculus, or tartar. The bacteria in plaque produce toxins, or poisons, that irritate the gums and can make them red, tender, swollen and more likely to bleed easily. As the disease progresses, the toxins destroy supporting tissues around teeth, forming pockets that fill with more plaque. This disease process may permanently damage bone that supports the teeth. Unless treated, the affected teeth can become loose and eventually be lost. Click here to learn more about gum disease. LANAP is a direct alternative to conventional periodontal surgery. The goal of LANAP is similar to traditional periodontal surgery - to reduce the gum pocket and to allow better access for complete root cleaning during your normal hygiene visit. LANAP has been shown to have a additional clinical benefit of bone regeneration to help you replace the lost and diseased bone previously supporting the teeth. One reason many patients choose to proceed with LANAP is due to the minimally invasive nature of the laser assisted procedures (minimal bleeding, no sutures, virtually pain free). Other reasons patients choose to have LANAP is due to compromised medical histories, to minimize gum recession, quicker healing, and time away from work and family. Click here to learn more about LANAP. Gum disease has been linked with health complications like stroke and pancreatic cancer. Dental implants and LANAP are state-of-the-art periodontal procedures we offer! Periodontal Plastic Surgery can transform not only your smile but also your self-esteem! Whatever your periodontal needs, our office can take care of you!